In the highland region of Sullk’ata, located in the rural Bolivian Andes, habitual activities such as sharing food, work, and stories create a sense of relatedness among people. Through these day-to-day interactions—as well as more unusual events—individuals negotiate the affective bonds and hierarchies of their relationships. 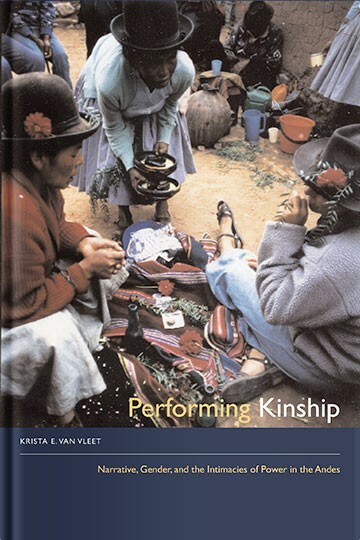 In Performing Kinship , Krista E. Van Vleet reveals the ways in which relatedness is evoked, performed, and recast among the women of Sullk’ata. Portraying relationships of camaraderie and conflict, Van Vleet argues that narrative illuminates power relationships, which structure differences among women as well as between women and men. She also contends that in the Andes gender cannot be understood without attention to kinship. Stories such as that of the young woman who migrates to the city to do domestic work and later returns to the highlands voicing a deep ambivalence about the traditional authority of her in-laws provide enlightening examples of the ways in which storytelling enables residents of Sullk’ata to make sense of events and link themselves to one another in a variety of relationships. A vibrant ethnography, Performing Kinship offers a rare glimpse into an compelling world.